The Original Sporn Halter is a no-pull harness that has been around since 1992. It consists of a collar with an unusual number of D-rings, and a cord with clips on either end and a ring and spring toggle in the middle. The cord is run through a pair of fleecy sleeves to prevent it from rubbing on the dog. The Original Sporn Halter is currently available in three different colors and four sizes to fit dogs with necks 9-33"around. Before there was the Simple Control Harness, before there was the Non-Pull Mesh Harness, there was the Original Sporn Halter. It was invented in 1992 and I'm sure I was using one shortly after the product was released. I used to walk Sid the Weimeraner from down the street on a Sporn Halter, I guess my neighbors were early adopters. Like every piece of dog gear, there's some good things and some bad things about this one. For some users, it is nothing short of a miracle. Back in 1992, it allowed my tiny prepubescent self to walk an enormous dog with ease. Sid the Weimeraner had major skin issues, but the harness never rubbed him raw, and back then the cords didn't even have those sherpa sleeves on them. On the flip side, this is a somewhat complicated piece of gear to put on, more so because it can come apart unlike similar products by the same company. The collar has two metal D-rings on the front and two on the back. Each side of the forked cord piece is run through a back ring, under the dog's front leg, and attached to the front ring on the same side. The plastic toggle at the center of the cord is then used to pull both sides snug. 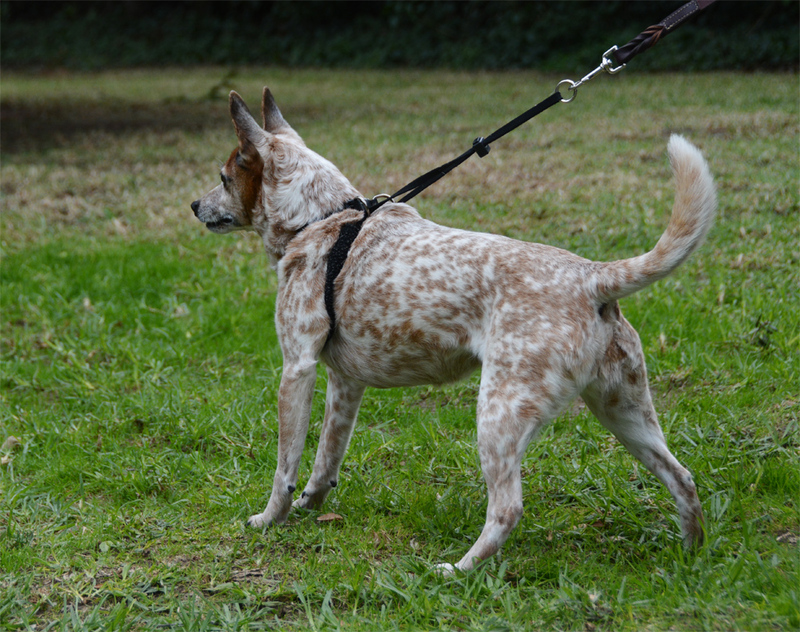 The leash is attached to the center ring above the toggle, so that the restraint cords are pulled tight when the dog pulls. I have for many years considered the Sporn Halter to be an aversive tool. Clearly pulling a thin cord into a dog's armpit must be painful, right? The primary reason I keep these in my toolbox is because they just don't seem to bother the dogs much. In my review of the Yuppy Puppy (now YUP!) Anti-Pull Harness, I said I was sure a dog charging to the end of their leash with a full head of steam would feel actual pain when they hit this harness. During our photo shoot, I actually got to see this happen. Annie the Escapologist saw another dog across the park and went flying to the end of a 6' leash in an Original Sporn Halter...and didn't even notice. The harness made her front legs sort of spread out to either side, airplane style, but she quickly figured out how to engage her back end and keep pulling with her front completely off the ground. I have now revised my opinion of string harnesses as aversive tools. Clearly they don't cause nearly the amount of discomfort imagined, given how well they work. 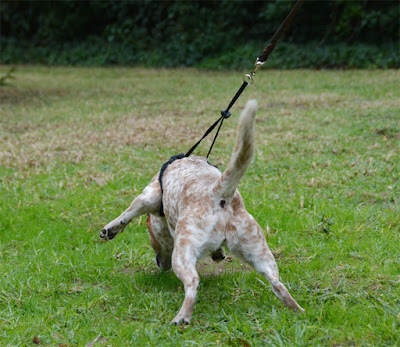 It seems they make the action of pulling on the leash inconvenient or awkward, rather than outright painful. Pros: Light for dogs that abhor heavy harnesses. Instantly effective on many dogs. Does not require the dog's feet to be lifted, or anything to be pulled over their head. Cons: Some dogs just don't find it that annoying. 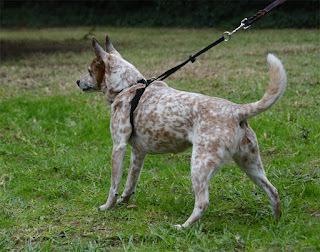 The cords on this design can rub the dog's armpits raw, the Sporn Non-Pull Mesh Harness places them a bit further back. Can be a bit complicated to put on for the spatially-challenged (or maybe looking at a mass of straps and cords and being able to immediately identify what it is and how it goes on is my superpower...). Is definitely not escape-proof, short-legged dogs and those that can back out of their collars may have an extra edge when it comes to popping out of it. Bottom Line: Annie the Escape Artist is a fantastic product tester for no-pull products as well as supposedly escape-proof gear. I had regarded this harness as difficult to escape until she tried to back out of it. Apparently, for some dogs, it's as easy to pop out of as a flat collar. Annie is a great example of how we learn more from difficult dogs than we do from the easy, well-behaved ones.